Fiamma Carry-Bike 200 DJ Ducato After 2006 Bike Rack (02093B89-). This item has been used as a trade show sample and has been partially assembled, the item has been inspected to the best of our ability and we have found signs of usage such as scratches or marks though they will not be detrimental to usage. The item is in otherwise excellent condition with no faults found. Fixing-bar (98656-656) will not come included but is available as an optional extra. These items are trade show samples, which are inspected by ourselves to the best of our ability and any major defects found will be repaired and mentioned in the description. You may find some minor faults or small marks which are not mentioned in the description, but will not be detrimental to its usage. Designed for van conversions with double rear doors. The installation of the 200DJ model requires drilling of the vehicle but only for the 4 security screws. The rear door can be opened without removing the bicycles. 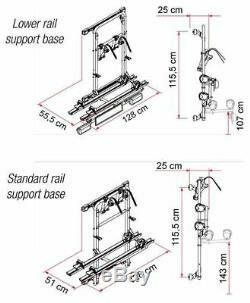 This version allows the installation of the rail support base in two different positions, one standard and one lower to make it easier to load the bikes. Lower version must be used together with the licence plate holder bar with regulation lights, Licence Plate Carrier. Articulated brackets for a quicker removal of the bike carrier. Fiat Ducato after 06/2006 (H2 and H3). Brand: Fiamma Fiamma Product Code: 02093B89- Vehicle Type: Van Conversion Vehicle Double Door: Yes Bikes Carried (Standard / Max): 2 / 2 Bike Block Pro D1 (04133E01-): x2 Security Strip (98656-419): Standard Rail Premium (98656-201): x2 Rail Premium S 98656-656: Optional Fixing-Bar (98656-474): Optional Brackets: Standard Weight / Max Load: 9 / 35 kg. Simply let us know when the collection will be made and we will have the item boxed and ready to be collected. 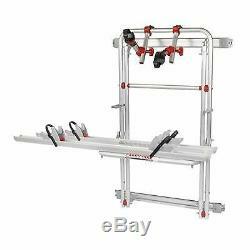 The item "Fiamma Carry Bike 200 DJ Fiat Ducato After 06 Bike Rack Cycle Carrier 02093B89" is in sale since Thursday, November 15, 2018. This item is in the category "Vehicle Parts & Accessories\Motorhome Parts & Accessories\Accessories". The seller is "tentsparesman" and is located in Hinckley. This item can be shipped to United Kingdom.